I often here people comment about how stupid people are today. “That planking is going to get someone hurt!” “Owling is just ridiculous.” While people do stupid things, I don’t they are any more idiotic than their predecessors. I found this column in the 26 Jun 1946, Oakland Tribune. It was written by Jack Burroughs. The column is all about the fading popularity of flag pole sitting. 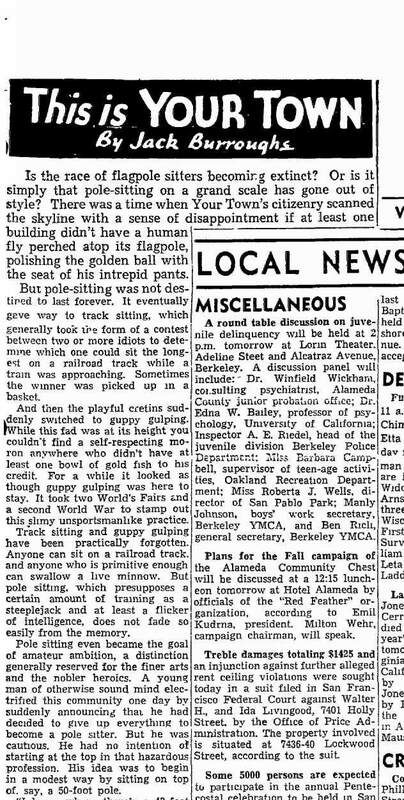 According to the columnist, when this fad was at the height of it’s popularity, you could look out from a window in Oakland towards buildings with flag poles. There you would find some young fool sitting on the ball of a flag pole. But, as fads go, flag pole sitting was soon replaced by track sitting. This game was a bit more dangerous. Contestants challenged each other to see how long they could sit on train tracks while a train approached.